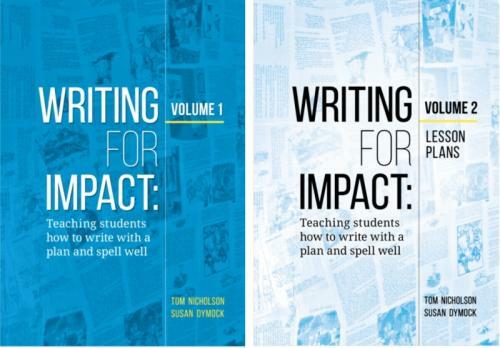 Teaching students to write for impact sets them up for success across many curriculum areas. Tom Nicholson and Sue Dymock analysed research on teaching writing to identify the skills students need to write for impact. Their approach is based on a simple view of writing: it is ideas presented well. The two volumes of this book work together to explain and show teachers how to teach students these essential writing skills. Nicholson and Dymock offer simple and effective strategies to improve both teaching and learning. The books include templates, plans, and links to videos that support these strategies. Volume 1 explains how to teach students to manage ideas and to master the elements of presentation, with an emphasis on correct spelling. The first half of vol. 1 focuses on ideas. Tom and Sue explain how teachers can support students to generate and organise ideas, and develop plans for their writing. They suggest two approaches: the “Read-Write approach” and the “self-regulated strategy development” approach. Both teach the writer to connect with the reader and to convey ideas in an organised way. Fiction, non- fiction, and text to persuade are each covered separately, with templates to help students plan and structure their work. The second half of vol. 1 focuses on presentation. It covers punctuation, grammar, vocabulary, and handwriting, with an emphasis on spelling. Nicholson and Dymock reject the idea of memorising word lists, instead using the layers of Anglo-Saxon, Romance (French and Latin), and Greek influences to show the structure and logic of English spelling. Greek words. The book is also supported by 15 short video lessons showing how to teach writing based on the authors' research. Tom Nicholson is a distinguished guest at Massey University, where he was a professor of education until early 2018. Tom has experience working with pre- and in-service teachers, and tutoring children with literacy difficulties. He is widely published in the field of literacy and is a member of the international Reading Hall of Fame.